One of the most important considerations dog owners face is what type of flea, tick and heartworm preventative to use. Most of these preventatives are made from toxic chemicals, and can create additional health problems if used incorrectly. Over-the-counter flea and tick medications have not been through the level of extensive testing performed on veterinary pharmaceutical flea and tick preventatives. It is usually best to discuss any use of medications and toxic chemicals on your pet with your veterinarian. Being an informed consumer can help you know what questions to ask. 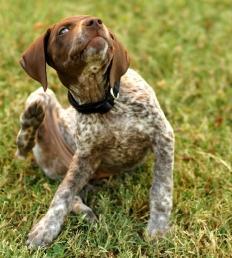 Fleas and ticks are only a minor issue if it addressed right away. These pests can kill your dog if you allow them to reach infestation level. Fleas and ticks spread disease, cause allergic reactions, and act as vectors in the spread of blood and intestinal parasites. There are many chemical preventative products available; most of them are safe if used properly. Several products use a combination of chemicals to prevent and kill both fleas and ticks. There are also one or two combination products that work as flea and heartworm preventatives. Currently, only Revolution appears designed to protect against all three parasites. Bathing your dog on a regular basis and manually removing fleas and ticks will aid in keeping them from infesting your home and yard. Bathing your dog in Dawn dish soap can be useful as the detergent dries out fleas and ticks. Follow baths with a flea comb and tick remover to rid him of any surviving bugs. Vacuuming your house several times per week will remove most fleas and ticks from carpeting and furniture. Vacuum your dog's bed and sleeping areas thoroughly, and wash loose bedding in the washer. Controlling flea and tick populations on your dog can often be done by addressing these parasites in his environment. Planting insect repelling herbs around the edge of your yard can reduce the number of fleas and ticks by making your yard unattractive to them. Lavender, lemon grass, mint, sage, and basil will repel these unwanted pests. Adding cedar chips to areas of your yard will also help. A very safe, natural, and biological method of ridding your yard of fleas is to introduce nematodes to the area. Nematodes are very tiny members of the roundworm family. Entomopathogenic nematodes are safe for people and animals. These tiny predators feed on flea eggs and larvae. Nematodes come in dry form; just sprinkle on the lawn, add water, and let the flea destruction begin! Food grade diatomaceous earth and silica gels can be used on your lawn, dog bedding, and carpeting. These are dusts that dry out the bodies of fleas and ticks which will eventually cause them to die. Be sure to wear a mask and goggles when applying these dusts as they can irritate the eyes and respiratory system. Insect growth regulators stop flea growth and cause cessation of the mating cycle. They are not pesticides, but they do control parasite populations. Heartworm is a deadly parasite that has several life stages, its preferred hosts are dogs, and it transmitted from infected dogs to uninfected dogs by mosquitoes. Heartworm lives in a dog's bloodstream, and eventually attacks the heart muscle. Symptoms begin with a soft cough during exertion such as running or playing with another dog. The dog later becomes lethargic and loses weight. When he has reached this stage of heartworm disease, he is in grave danger of dying. According to the Heartworm Society this deadly parasite lives on every continent except Antarctica. Talk to your veterinarian about which heartworm preventative is the best option for your dog. Most natural heartworm preventatives have not undergone clinical studies. Certified organic black walnut tinctures as part of an individualized holistic prevention protocol is one of the holistic approaches to heartworm prevention for dogs. There is anecdotal evidence that this type of preventative care is effective. One of the best ways to reduce the transmission of heartworm, fleas and ticks onto your dog is to take measures to discourage mosquito, flea, and tick populations. Keep your lawn trimmed short, do not allow standing water to collect, and introduce plants which repel pests.